WordPress theme designs are controlled by CSS, a web design language. The tricky part is, you have to understand a little bit about coding to make sense and edit the file. That means that 12px is the font size for the header area. So if you want to increase it, just increase that number to 14, for example. Most themes designers intuitively label the sections of your site, so it should be fairly easy to decipher what you’re editing. However, some don’t make it as easy to understand. It really depends on how it was coded. 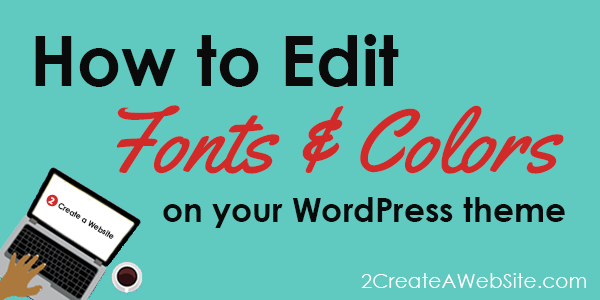 There are tons of premium WordPress themes that have editors or add-ons to help you customize for your overall theme design, fonts and colors. Look for themes that offer drag and drop design features and other types of customization tools so you don’t have to dig into the code. For example, if you buy a StudioPress Genesis theme (this is the framework I use), they have a premium plugin (add on) called Design Palette Pro that lets you make changes to many of their themes. Headway Themes are also very customizable and make use of the drag and drop functionality. I’ve never used them, however. Before editing the CSS file, copy and paste the code into a text file and save it. That way if you make a mistake, you’ll be able to restore it.